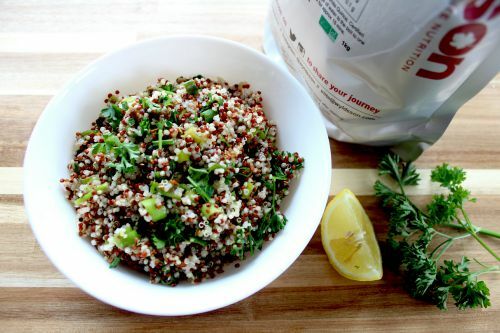 Quinoa is easy to prepare and its fluffy texture make it an excellent alternative to white rice or couscous! 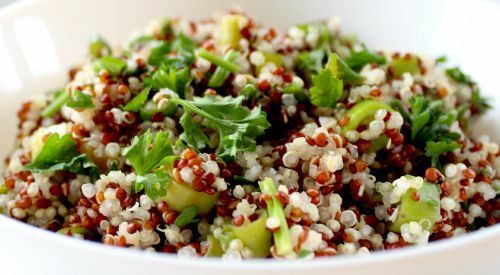 However, unlike wheat or rice, quinoa is a complete protein – containing all eight of the essential amino acids. It has been recognised by the United Nations as a supercrop for its health benefits: packed with dietary fibre, phosphorus, magnesium and iron. It is also gluten-free and easy to digest. 1 Rinse in a sieve under cold water. 2 Bring two cups of water to the boil to one cup of grain, cover, simmer and cook for approximately 15 minutes. 3 Drain through a sieve to make sure there’s no water lingering in it. 4 Cooked Quinoa should have a slight bite to it (al dente). For more info, check out this decent article. 1. Wash, zest and juice the lemon or orange if using. 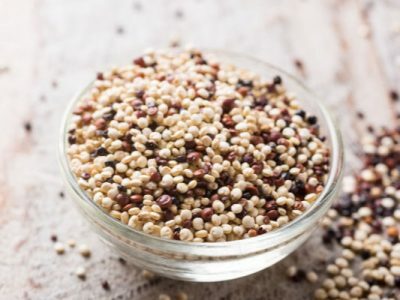 Rinse the quinoa in a sieve with cold water. 2. Heat the olive oil, add zest and quinoa. Sauté until quinoa begins to heat and the citrus aroma rises. Add seeds or nuts and raisins stir to coat in oil. 3. Add stock or water, reduce heat to the very lowest for 15 minutes until the moisture is absorbed. Add 2-3 tablespoons lemon or orange juice to taste and a little salt and pepper if needed. Garnish with lots of chopped fresh herbs, mint is particularly good. Serve as you would rice, couscous, noodles or potato. Ingredients: Red & White Quinoa. Storage: Reseal after opening. Store in cool, dry place away from direct sunlight.